If you missed the Sample Food Festival last weekend, you can still have a taste of the delicious food products the region has to offer. Here are five of the best from my visit to the festival; available from the region’s weekly farmers markets, general stores, butchers and delis. Wattle Tree Creek Farm near Dunoon is owned by Claire Parry – a passionate advocate of native bush ingredients. Her range of chutneys and jams are extremely popular for a reason. Stock up early on their sea celery mustard pickle to pair with your Christmas ham or enjoy your morning croissant with their raspberry jam spiked with wild lime and lemon myrtle, both of which cut through the fruit’s natural sweetness. The hills of the Byron hinterland are dominated by plantations of round squat macadamia trees and their taller, skinnier cousins, the pecan tree. Ash and Matt, the owners of Barefoot Farm, specialise in the latter, with over 300 pesticide- free pecan trees on their farm. You don’t have to visit the pantry café to taste their produce—their dark-chocolate-covered pecans and maple-roasted variety are available in take-home pouches perfect for a snack on your way home. 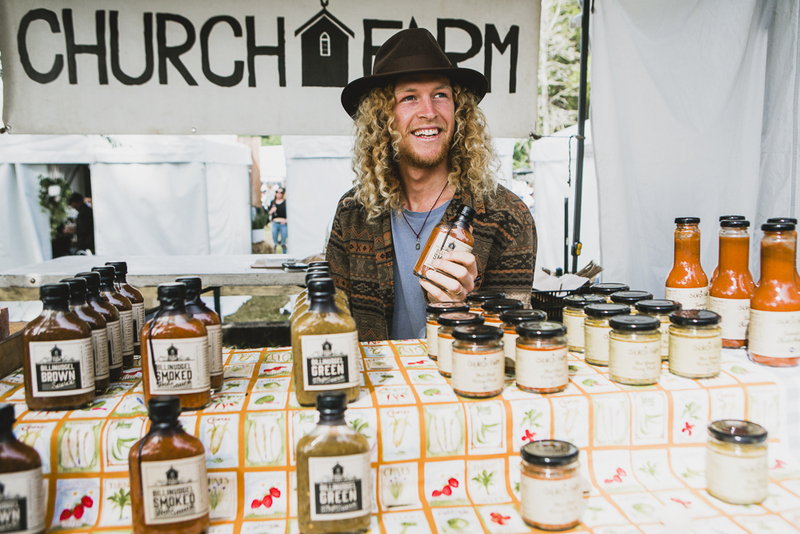 A family-run business, Church Farm General Store prides itself on creating products that are as natural as possible without compromising on taste. Andrew and Amanda make their range of sauces and curry pastes entirely by hand, using produce they’ve either grown themselves or sourced from neighbours. No extra sugars or preservatives here. The Billinudgel-smoked hot sauce is made from charred chillies combined with ginger, garlic and spices, making it perfect drizzled on eggs or tacos. Kids will love the real tomato ketchup—the sweetness comes from coconut sugar and date instead of the nasties normally found in the store-bought variety. Winner of a silver medal at last year’s Sydney Royal Fine Food Show, the fish rillettes from the Bay Smokehouse are a nod to owner Damien Curtis’ French childhood, but with a Byron twist. The rillettes are made from local wild-caught smoked fish and blended cashews, which provide the same richness as using butter. This is a hugely addictive dish that’s perhaps best eaten spread on sourdough bread with a squeeze of lime. Salumi is already well-known in these parts, available in most local grocery stores, butchers and delis. But visitors to the Byron Shire should take advantage of the opportunity to purchase some of the artisan meat producer’s harder-to-find products, such as spicy nduja, a spreadable salami that’s wonderful dolloped over pizza or stirred through pasta; or guanciale, an essential when making the perfect spaghetti carbonara.